Finland finished the preliminary round as the top overall seed with 12 points and a perfect 4-0-0-0 (W-OTW-OTL-L) record. Their wins came against Slovakia (5-2), France (7-0), Russia (5-4), and the Czech Republic (4-2). They had a +13 goal differential, tied with Canada for the best at the end of the preliminary round. Finland played Belarus in the quarterfinal matchup and earned a 5-2 victory before shutting out rival Sweden (2-0) in the semifinal yesterday. Finland is led offensively by Niklas Nordgren (7-2-9) and Kaapo Kakko (3-6-9), who are tied for third in tournament scoring with nine points each. Nordgren was recently ranked as the 20th best international skater available for the 2018 NHL Draft by NHL Central Scouting Bureau. The forward group also boasts Jesperi Kotkaniemi (3-4-7) who is currently the sixth-ranked skater. Goaltender Justus Annunen (fourth-ranked international goaltender prospect) ranks third in the tournament with a .910 save percentage and 2.00 goals-against average. All-time, the U.S. is 10-1-0-5 (W-OTW-OTL-L) in 16 games against Finland and is 7-1-0-2 in the last 10 matchups. The U.S. has outscored the Czech Republic 46-33 in those 16 matchups. This will mark the fourth time the two countries have faced each other in gold-medal games (2006, 2015, 2017) and the first time they will meet in back-to-back medal games. The U.S. has previously won all three of those matchups. Overall the U.S. is 4-1 (W-L) against Finland in the playoff round. The U.S. has appeared in 13 of the 20 gold-medal games in the history of this tournament and has won gold 10 times ... The U.S. is 7-1-0-2 (W-OTL-OTL-L) in its last 10 matchups against Finland ... 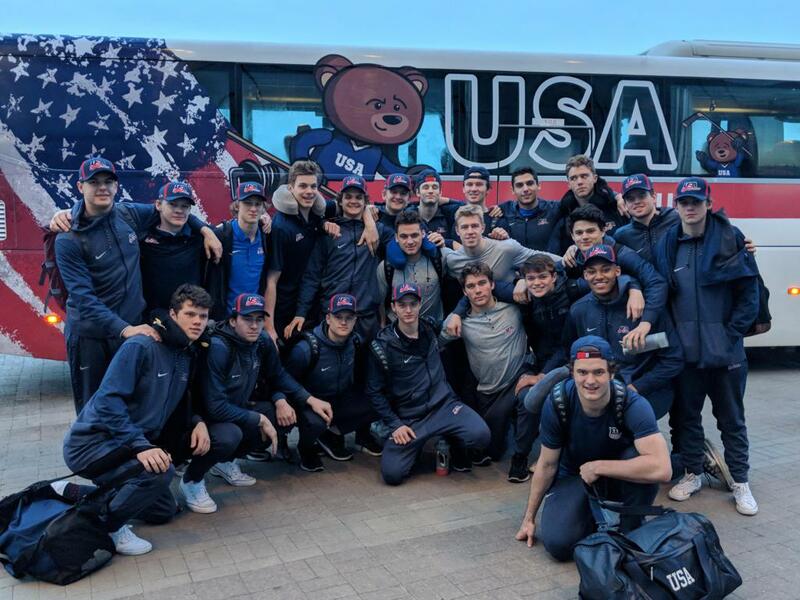 The U.S. has faced Finland in more gold-medal games (3) than any other country and has won each matchup ... Jack Hughes (Orlando, Fla./USAH NTDP) currently sits atop the tournament leaderboard in points with 12 (5-7-12) through six games ... Joel Farabee (Cicero, N.Y./USAH NTDP), Mattias Samuelsson (Voorhees, N.J./USAH NTDP) and Oliver Wahlstrom (Quincy, Mass./USAH NTDP) were named the Three Best Players for Team USA on Saturday ... The U.S. is averaging 43.33 shots per game through six games and is only allowing opponents to 22 shots per game ... The U.S. owns the third-ranked power play and top-ranked penalty kill units in the tournament ... The U.S. is searching for its first gold medal on Russian soil, having previously earned both silver and bronze medals in past events. 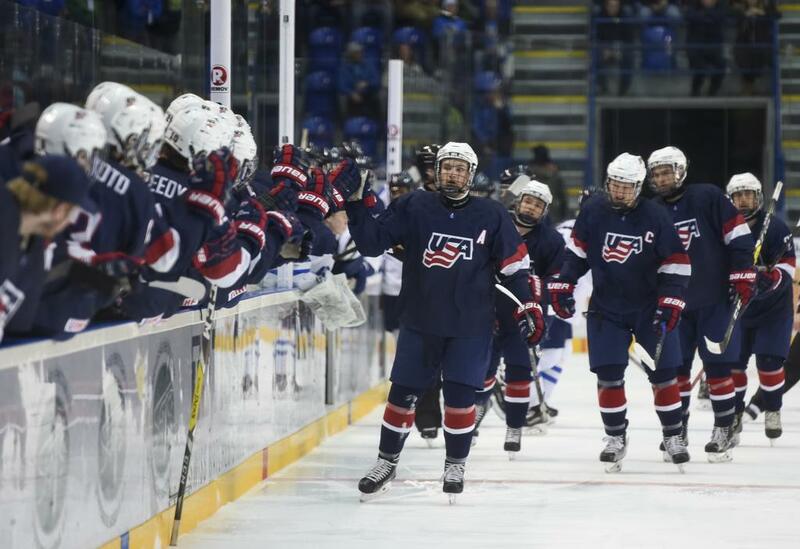 The two teams last met a year ago in the gold-medal game where current Team USA forward Joel Farabee (Cicero, N.Y./USAH NTDP) scored twice to help the U.S. defeat Finland, 4-2. Colin White (2015/Ottawa Senators) scored the game-winning goal in overtime to help the U.S. Men's National Under-18 Team knock off Finland, 2-1, at the Bossard Arena in Zug Switzerland in the gold-medal game of the 2015 IIIHF Under-18 Men's World Championship. Jack Roslovic (2015/Winnipeg Jets) also scored for Team USA in the victory. Evan Sarthou (Black Diamond, Wash./Retired) started in net for Team USA and made 19 saves in the victory. In the 2006 gold-medal game, Mike Carman (Apple Valley, Minn./Retired), Rhett Rakshani (Huntington Beach, Calif./ Malmö Redhawks) and Chris Summers (Milan, Mich./Wilkes-Barre Scranton Penguins) scored for the U.S. in a 3-1 win against Finland. Goaltender Joe Palmer (Yorkville, N.Y./Retired) made 30 saves on 31 shots in the victory. This marked Team USA's third gold-medal game victory. The U.S. will play in its tournament record 14th gold-medal game against Finland on Sunday. This marks the fourth showdown between the two countries in the gold-medal game, the most between any two countries tournament history. Overall the U.S. is 8-2-0-3 (W-OTW-OTL-L) in gold-medal games. The U.S. is 6-1 in its last seven gold medal games. From 2009-2015, Team USA competed in a tournament record seven consecutive gold-medal games, winning six times and falling just once.